Obama and other world leaders were sitting around the UN private lounge contemplating what to do about the Syrian crisis that was disturbing all of the Mideast and Europe. Depression had set in due to the difficulties that had arisen over the situation that seemed to escalate no matter what their efforts were. And it all was basically because of one man- Bashar al-Assad, the dictator of Syria. The X-Box like control mechanism that determined the bombings of the day lay on a table between them. No one had the enthusiasm to touch it. Suddenly the door burst open and an energetic presence entered. "Greetings Comrades. I am here to solve the Syrian problem!" The unusually smiley face of Vladimir Putin greeted all the seated dignitaries as he hurriedly went around the circle of sofas shaking hands. "I am the answer to all your difficulties!" The guests, at first stunned by his unexpected entrance, slowly woke up from their trance. German Chancellor Angela Merckel was at first upset by his appearance as it was well known he had been a KGB agent in her country of East Germany during the Cold War. Quickly, though, the present day situation came back to her and she applauded his being there. "Oh good! Now we have some real forces to help battle ISIS!" she stated. President Obama wasn't quite as enthusiastic, but he knew that Putin taking part in the action would relieve some of the pressure off of him. He put out his hand to shake and said as cheerful a "Welcome" as he could muster considering his past interactions with the Russian top dog. The other Heads of State, mostly European Prime Ministers, nodded or bowed to Putin as they gripped his hand. The Saudi prince who was there continued to sleep soundly at his end of the sofa as he had done little to help the whole time he had been there already and the others, including Putin, just left him to his sleep. Once he had made the rounds Putin clasped his hands together and asked "OK, where is that bombing control?". "Right there on the table." John Kerry pointed out. With an afterthought he added "Remember, we are only bombing the ISIS areas!" "Of course, of course!" 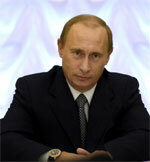 said Putin softly, concentrating more on the control stick and not on what was being said. "Right good of you to join us." Stated British Prime Minister David Cameron commendingly. "Are you getting the hang of it?" asked French President Francois Hollande of the Russian President. "I have much experience....." answered the Russian demi-god focused intently on the screen before him as he fervidly manipulated the control. "...much experience...."
Obama thought to turn on the large viewer screen on the wall so that they all could see what Putin was doing. "Hey!" said John Kerry "You are hitting all of our Syrian allies down there! What are you doing?" Putin was totally absorbed by what he was doing and ignored him. Obama rose from his couch. "You can't do that! We agreed to only go after ISIS!" "ISIS, terrorists- all the same. I take care of them once and for all now." ""But....but ….. that is not the proper way to do things internationally!" stuttered John Kerry,the Secretary of State, astounded at Putin's gall. "That goes against all codes of social ethics! It goes against the Geneva Convention!" "Russia does not need ethics or Geneva Convention. Russia big enough to do what it wants." The Russian President said over his shoulder as he rained bombs down upon a anti-Assad village. "What shall we do?" whispered all the participants to one another. No one had an answer. They did not want to anger the Russian bear. Overhearing this Putin finally raised his head from his very special game. "I know what I do." he said with a finality. "I take control myself!" and with that ripped the control out of the socket, grabbed the machine it was attached to and stormed out of the room. The Heads of State all looked at each other quizzically not knowing what to do. Finally they all shrugged and said "Well, I guess it is all out of our hands now. Hey, what is the dessert today down at the restaurant?"